A ceramic pot--a cooking or storage vessel made of clay--is an important object for archaeologists. As containers, pots tell us how people prepared and kept food. Sometimes microscopic deposits of food may be found on pot sherds. Firing clouds on the exterior tell us about how the pot was made, and analysis of clay types and inclusions (called temper) can tell us about where the pot was made. But a pot is more than its measurable characteristics. It was made by a person; an artisan who may have used symbols or patterns from her ethnic or family tradition to form and decorate the pot. These symbols may also have been woven into cloth or painted onto buffalo hide, but only on the pot would those symbols survive over the centuries. Thus, more than any other kind of artifact, a pot carries with it the conscious or unconscious cultural background of its maker and her group. The most distinctive Oneota trait is the shell-tempered, globular jar with a constricted opening and a rounded bottom. Several decorative patterns occur on this type of jar throughout the Upper Midwest; the one most commonly associated with Orr phase Oneota and the Ioway is called Allamakee Trailed. Oneota potters collected clay and mixed it with burned and crushed clam shells. 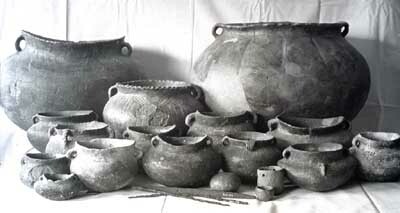 Then they built jars using the coil method, producing thin-walled, sturdy, lightweight vessels. Before they were fired, the pots were decorated with geometric lines, dots, and tool impressions on the outer shoulder and rim, on the lip, and sometimes on the rim interior. Loop and strap handles were created by a thin strip of clay attached to the rim. Some pots are cord-marked, resulting from a woven mat or cloth pressed into the clay before it was fired, leaving the pattern behind. After sun-drying, the pots were fired outdoors, probably in groups. 1999. Bison Hunters of the Western Prairies: Archaeological Investigations at the Dixon Site (13WD8), Woodbury County, Iowa. Report 21, Office of the State Archaeologist, The University of Iowa, Iowa City.